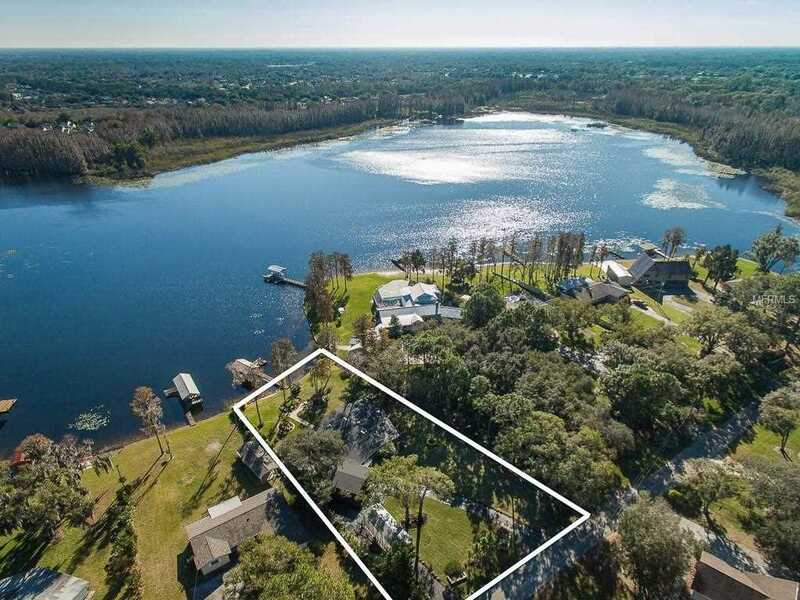 One of a kind LAKEFRONT home with NO Deed Restrictions! SKI, JET SKI, TUBE and FISH on a Private Ski Lake. Enjoy Sunrises and Picturesque lake views. With ¾ of an acre there is plenty of space to bring your ski boat, bass boat, jet skis, RV and any other toys that fit your lifestyle. This home has been meticulously maintained and completely renovated and updated. Updates include, NEW ROOF (2018), NEW WELL (2018), NEW DOCK (2018), remodeled Kitchen with granite counter tops, center island and SS Appliances, Plantation Shutters, NEW GARAGE DOOR (2016). THIS HOME LOOKS AND FEELS LIKE A BRAND-NEW HOME with 12' ceilings in the main Living areas. A custom stone wall is the perfect addition to the luxurious Master Bedroom suite. Enjoy a cold beverage from your own private bar with built in kegerator. Your Private Backyard Oasis consists of beautiful mature trees and professional landscaping. No expense was spared when renovating the private dock with composite wood decking, custom lighting, metal roof and electric boat lift. No Flood Insurance, NO HOA or CDD fees. Lakefront Paradises like this RARELY come available. Bird Lake is a hidden treasure with only 26 homes that have ski & power boat access on the lake. Convenient location that is close to SR 54, US Hwy 41, Dale Mabry Hwy, Suncoast Parkway SR 589, I-75/I-275. Minutes from Wiregrass Mall, Tampa Premium Outlets, Hospitals and all major shopping and dining. This amazing property will not last long. Call today for your private showing. Lot Size: 0.75 Acres / 33095 Sq. Ft. Directions:From Hwy 41 North, Go East on SR 54 approximately 1 mile Turn Right on Daiquiri Lane. House is halfway down the street on the Left. SchoolsClick map icons below to view information for schools near 1724 Daiquiri Lane Lutz, FL 33549. Listing provided courtesy of Exp Realty LLC. MFRMLS data last updated at April 19, 2019 8:29:27 AM PST. Home for sale at 1724 Daiquiri Lane Lutz, FL 33549. Description: The property at 1724 Daiquiri Lane Lutz, FL 33549 in the 36-26-18-0000-00400-0000 subdivision with the MLS# T3156349 is currently listed for $555,000 and has been on the market for 67 days. You are viewing the MFRMLS listing details of the home for sale at 1724 Daiquiri Lane Lutz, FL 33549, which features 3 bedrooms and 3 bathrooms, and 2458 sq.ft. of living area.